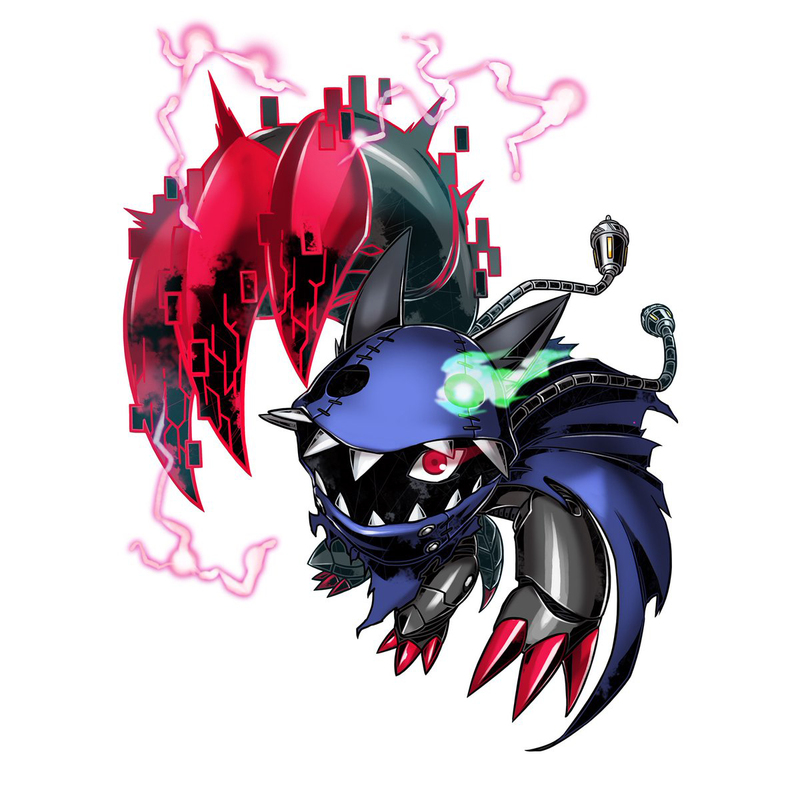 For the Appmon species, see Hackmon (Appmon). A Small Dragon Digimon that shines a cool white. Its unfettered and restraint-hating, adventure-loving way of life is likely due to Gankoomon's DNA. It faces the rigorous trials imposed by Gankoomon with an air of composure. It has a masterful sense of combat due to its lineage, and because of its training with its chaperones, the Sistermon sisters, it can more than hold its own in battle against its opponents even if they're a Perfect. It specializes in close combat that capitalizes on its keenness, cutting the opponent to pieces with its sturdy claws (Fif Slash), rotating its tail like a drill and thrusting it into the opponent (Teen Ram), and spewing "Baby Flame" from its mouth, which is also usable as a diversion. It follows its dreams of becoming a Royal Knight like Gankoomon as it fights through continuous battles. A Beast Digimon whose fur shines a cool white. Its dream is to become a Royal Knight like Gankoomon. As a descendent of the Royal Knight Gankoomon, it chases after Gankoomon and faces its rigorous trials with an air of composure. It has a masterful sense of combat, and because of its training with its chaperones, the Sistermon sisters, it can more than hold its own in battle against even high-ranking opponents. 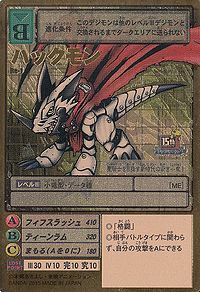 A Small Dragon Digimon that shines a cool white. It has a masterful sense of combat due to its lineage, and because of its training with its chaperones, the Sistermon sisters, it can more than hold its own in battle against its opponents even if they're a Perfect. It specializes in close combat that capitalizes on its keenness, cutting the opponent to pieces with its sturdy claws (Fifth Rush), rotating its tail like a drill and thrusting it into the opponent (Teen Ram), and also, the "Baby Flame" it spews from its mouth is usable even as a diversion. 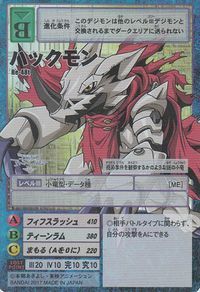 Inheriting Gankoomon's lineage, it's a Beast Digimon which conceals an extraordinary sense of combat!! A romanization of hakku (「ハック」), derived from haku (「白」), meaning 'white'. Anime/Manga Digimon Adventure tri. - "Reunion"
Fif Slash [N 1] フィフスラッシュ Fifu Surasshu Fifth Rush Cuts the opponent to pieces with its sturdy claws. Rotates its tail like a drill and thrusts it into the opponent. Spews fire from its mouth. Hackmon in Digimon Adventure tri. Hackmon is a servant of Homeostasis who observes Meicoomon from the shadows. Hackmon is the protagonist of one of the game's storylines. Hackmon appears along with Gankoomon and the protagonists of other Digimon series in a special, post-game scenario. 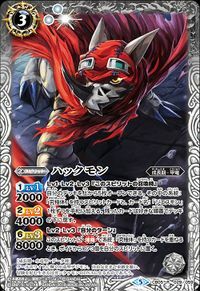 Hackmon is the young disciple of Gankoomon and apprentice of Royal Knight. This young, small dragon of a new generation aims to become a holy knight! A small, mysterious dragon who appears to be investigating the infection incident. A Small Dragon Digimon that shines a cool white. Its unfettered and restraint-hating, adventure-loving way of life is likely due to Gankoomon's DNA. ↑ 1.0 1.1 Fif Slash and Teen Ram are puns on 'fifteen', referring to Hackmon being the mascot Digimon for Digimon's 15th anniversary.